Super-strong electromagnetics coupled with a hidden fingerprint scanner make this convincing copy of Mjolnir, Thor’s mystical hammer, respond only to its creator. As the Marvel Comics version of the story goes, only those worthy of the power of the hammer may pick it up – it becomes an impossible anchor in the grip of anyone else. Allan Pan, an electrical engineer, set to work creating his own real-life version. Electrical currents produce a magnetic field that pull the hammer toward any metal surface. 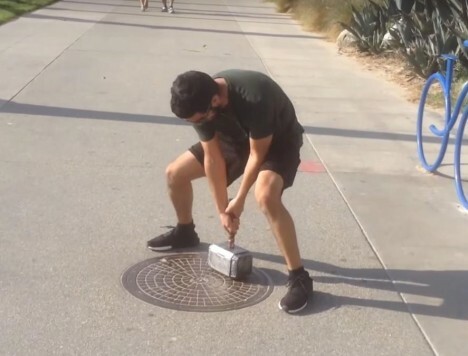 Essentially, it can be ‘locked’ in place anywhere with metal on the ground (or just under the surface) mimicking the magical properties the hammer is supposed to posses. Using powerful electromagnets and a fingerprint scanner, an electrical engineer builds a replica of Thor’s hammer Mjolnir that can only be hefted by the worthy. Pranking passers by, its maker is able to pick the device up with ease, then confuse the heck out of the strongest people who attempt to lift it (a bit like King Arthur with Excalibur, come to think of it). “The handle is attached to a capacitive touch sensor, which in turn is attached to an Arduino Pro Mini and a solid state relay, which serves as a switching device. As soon as someone grasps the handle, the electromagnets switch on, attaching the hammer to the metal surface.” Alas, this version cannot yet call down lightning strikes, nor return to the hand that throws it, but perhaps Mjolnir 2.0 will pick up where this one leaves off.